What is a Mobile Patrol? Mobile patrols are security guards equipped with vehicles that allow them to monitor your entire property, both inside and out. While standard security guards are often situated inside patrolling your halls and monitoring your security systems, mobile patrols handle the exterior of your building. These patrol units are trained to identify suspicious behaviour and address it immediately, protecting your property from vandals, thieves, and other potential risks. While internal security guards focus on monitoring security systems and patrolling the halls of your building, mobile units offer comprehensive security for your entire property, including the exterior and perimeter. For large industrial or manufacturing properties, this can include a vast amount of property and multiple buildings, requiring a significant security force to keep it protected. Mobile units can cruise around in security cars, ensuring your entire property is free of any external threat. By expanding your security services to include mobile patrols, your security team will be much more efficient in identifying possible security risks and addressing them in a calm, collected, and time-sensitive manner. If a security guard who’s working the night shift alone notices suspicious activity on the far corner of your property, it is highly unlikely they will be able to effectively address the issue on their own. Not only can it take them a long time to get to the other side of the property, but they’d also be leaving their post vulnerable. With mobile security patrols, you’ll be able to give your security team the back-up they need to handle these kinds of situations. While your security guard monitors the situation with your comprehensive security system — which can include alarms, video monitoring, and other security features — the mobile patrols can immediately respond to the possible threat. This ensures that your security team has immediate response times, which can be much more effective in preventing criminal action than waiting for the authorities to arrive. Mobile security patrols are trained to defuse tense situations. From aggressive and violent individuals to potential security threats, they can maintain composure and work towards a solution. This is also a useful trait in other emergency situations, such as fires, medical emergencies, and power outages. As the first responders to many situations and security alarms, mobile patrols can assess the situation and make sure the proper authorities are notified. In cases of physical violence, mobile security guards are trained in self-defence to help minimize risk and subdue an assailant until the authorities arrive. For large industrial facilities — especially those will multiple buildings and thousands of feet of perimeter — mobile units offer targeted security patrols for high-risk areas. If vandals or teenagers are sneaking on to your property, your mobile patrols can focus on these areas, deterring trespassers from illegally entering your property and causing damage. With their vehicle patrols, these security units can effectively monitor a much larger area and respond quickly, giving you more flexibility with your security detail. The mere presence of security will make any thief, vandal, or trespasser think twice about entering your property. Mobile units — beyond their effectiveness in responding to suspicious activity — are also a great deterrent of crime. For those looking to break in late at night, 24/7 mobile patrols will make them consider choosing another location, as the risk of robbing a guarded facility is simply too high. 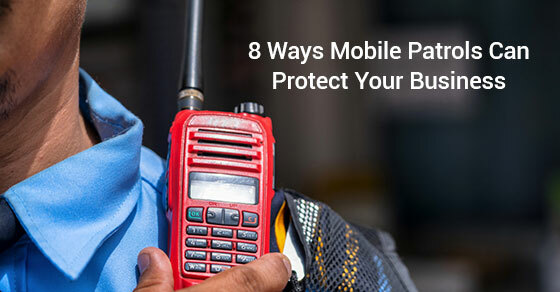 While it may seem like your mobile security units won’t encountering a high number of issues, that could be because their actual presence will reduce the number of incidents that occur on your property. In either case, having a mobile patrol is money well spent to ensure you have the peace of mind that comes from knowing that your property is protected. For convenience sake, security guards and mobile patrols are often granted keyholding rights for large office buildings, commercial facilities, and manufacturing centres. Since many security units offer 24/7 coverage while cycling through different shifts of guards, there will always be a security presence on your property. By giving these security guards keyholding privileges, you can ensure that they can address a situation quickly and efficiently. Whether your staff gets locked out of an area of your facility or an emergency occurs, having an extra set of keys in trusted hands is never a bad idea. In the event of an injury, medical emergency, fire, flood, or criminal situation, mobile security units are often the first responders. Security guards are trained in first-aid, CPR, and other life-saving methods, so they can offer assistance in medical situations before medics arrive. They are also highly trained in self-defence and decision-making, so they can effectively control a tense situation while protecting your employees and clients, and minimizing damage to your property. This added security presence can go a long way to making sure your employees and clients feel safe, secure, and comfortable in your facility. The peace of mind that comes from knowing a trained security professional is monitoring the property will make everyone more comfortable and productive. At Optimum Security, we offer a wide range of security services to help keep your business, property, or event safe. Our mobile patrols are highly trained to identify suspicious activity and mitigate threats. We work with our clients to tailor our services to your individual needs, ensuring you get the most effective security services for your budget. For more information about our mobile patrol services or to discuss your security needs, call us at 604-644-9229 or contact us here.